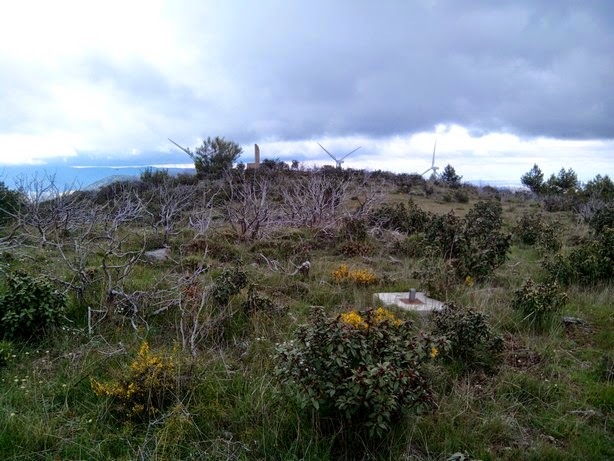 This weekend, as we hadn't any plans for sure, I decided to make a short "raid" around our vecinity regions of La Rioja (EA1/LR) and Soria (EA1/SO) new for me. To make it more interesting for my son Oier, we organized at the same time a visit to the exposition of "ichnites" -dinosaur footprints- quite abundant at La Rioja (which is already famous around the world because of its wines). 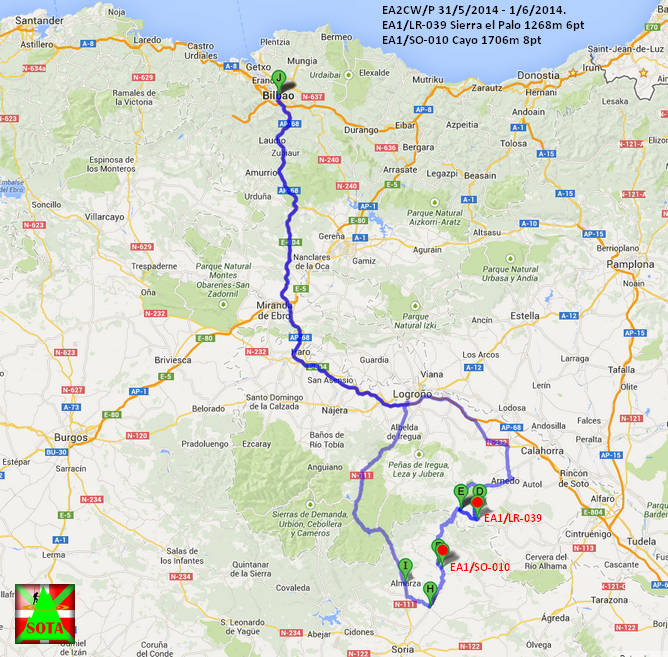 So, saturday morning (31/5/2014) we headed towards Enciso, a small village near Arnedo, and 2 1/2 hours from Bilbao. After arrival, we went to our hostel to have our room booked, and just later, to "El barranco perdido" a complex at Enciso, which blends an ichnites exposition, archaeological works for children, and an adventure complex, with ropes, flying foxes, bow throwing, and some more activities on open air. There we spent some hours, until 15:00 UTC when we left for activating the first SOTA summit. 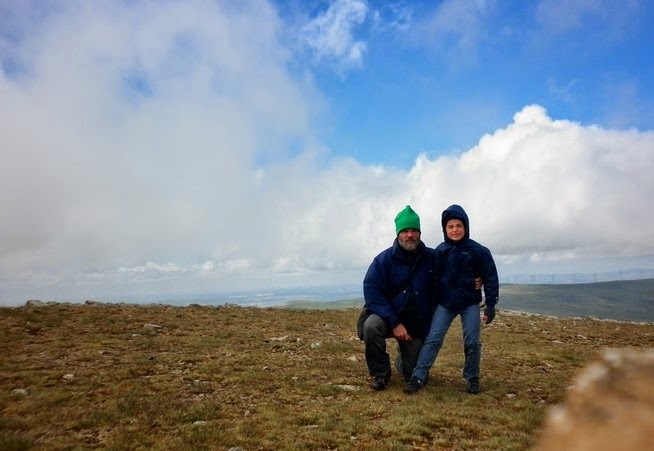 EA2CW(the small one) & Co.
At the beginning, SOTA was a secondary target, as the weather was said to be quite bad, with rain, storms and strong winds. But we were happy to have some time of good (good enough at least) weather. 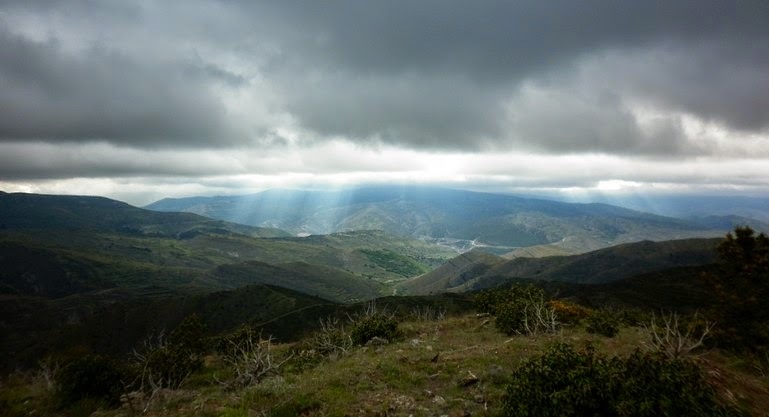 On our way to Sierra El Palo (EA1/LR-039), 1268m, 6 pts. we found some places around Enciso where the footprints have been found. There were also several 1:1 scale reproductions of various dinosaurs. It's hard to understand which size they were unless you can see it! Sierra el Palo summit, 1268 m.
The weather was getting worse, but the path to the summit was not too long -about 1,5 km- so finally, we decided to hike and, after arriving, we mounted the FT-817 with the small telescopic antenna SPX-100 that I carried among the norcal doublet. As the wind became stronger, and the rain started, we were only able to make a very short activation on 14 mhz. Just spotting and 15 min of operation to make 13 QSOs. Before getting all wet, we left the summit quick. 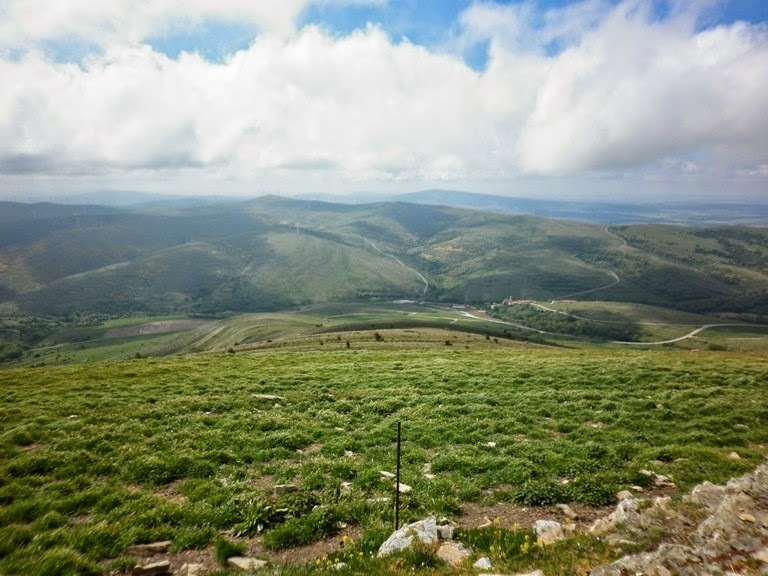 At least, during the descent, we could watch some delightful panoramas, as the one below. A bit later, we were to the hostel at Enciso for dinner and then straight to bed. Next day, sunday, we were ready to make our second summit, about 60 km south from Enciso, but already in the EA1/SO region. The chosen summit was Cayo, EA1/SO-010, 1709 m. and 8 points. 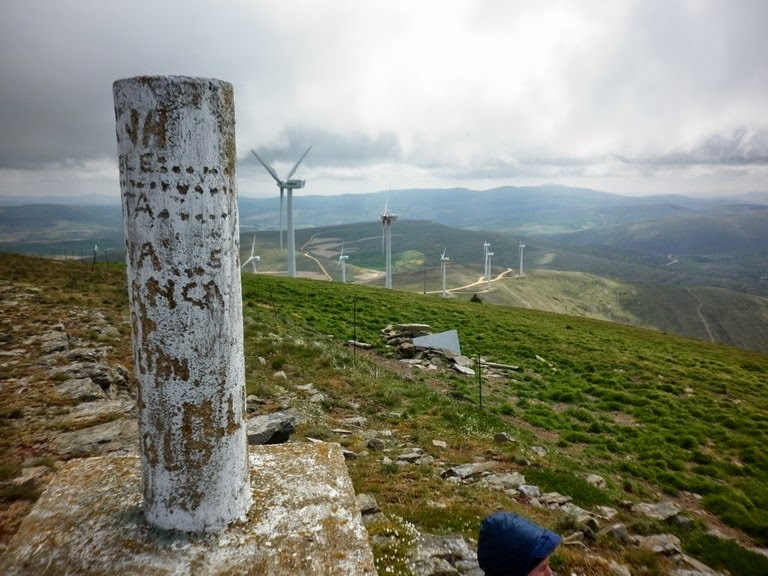 The ascent was short (about 1 km) and the day was sunny, but there was a very strong wind, and Oier -even we found a small shelter near the summit- didn't want to spend more time than needed to make the activation. Again I chose to mount the telescopic antenna, because I was sure that the 6 m. pole would fly free on such heavy winds. I used also 6 short ground wires of about 3 meters long, which were enough to make qsos on 14 Mhz (CW) with N1EU (589) and CU3AA (59+9) On the other side, the signals from EU were quite lower... ask the propagation gods why! I was lucky enough to make S2S QSOs with Andy MM0FMF/P, Tom M1EYP/P and Barry MW0IML/P. Just half an hour only on 14 mhz for 32 QSOs. To recover from cold and efforts, we had later a splendid meal -salad and lamb chops- at Almazara (Soria) during our returning trip to Bilbao. What more can you ask for? 2 new regions, 2 (unfortunately short) new summitss of 6 & 8 points, and -for short- a good SOTA weekend! Well, don't forget the dinosaurs!